ROYAL PALM BEACH — Imagine for a moment, parents, that your child has died. Bear for a moment, that profound loss. Feel the burning for a moment behind your eyes. Now imagine the parents who never escape that moment, who live in that reality every day. It’s that profound emotional connection between parent and child that is inspiring one local group working to build a place of healing and hope for all parents who have lost children. The Angel of Hope Children’s Memorial Garden will be a place where parents who have lost children can grieve, meditate, think, share their experience, find peace and experience hope. 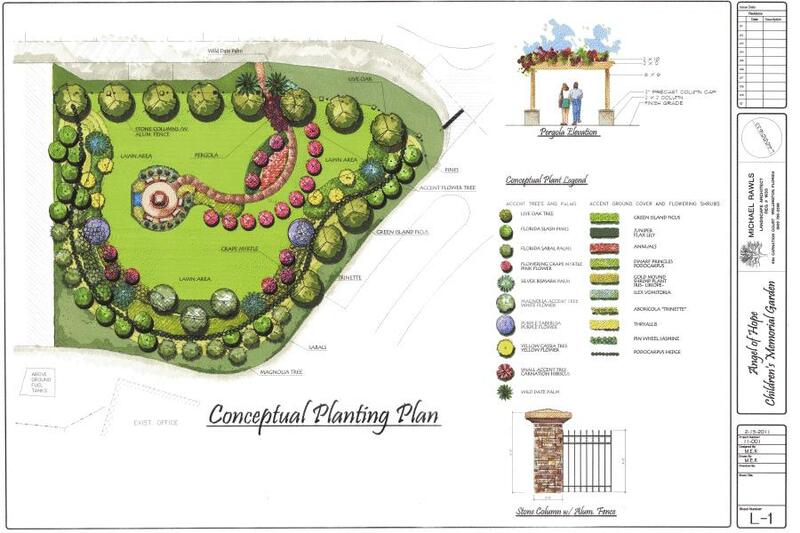 It will be built on land inside Our Lady Queen of Peace Cemetery with a heavily landscaped garden to provide tranquility, and its centerpiece will be an angel statue, carved originally in remembrance of the sculptor’s child who died. “It’s a place to feel whatever you need to feel,” says Ken Torres, whose 28-year-old son Kenny was shot and killed in 2008. Torres and other parents who met through the local Compassionate Friends group are raising money to erect the Angel of Hope and install the garden so parents from throughout Palm Beach County who have lost children will have a local memorial. There are 25 similar angel monuments throughout the country. For Torres, it will be the physical place that he and his wife Keri lack, where they can visit with their son, who was cremated. It will be a place to freely talk about him with others who understand, he said. Inscribed bricks with the names of lost children will encircle the statue. Darlene Fernandez, who lost her 16-year-old daughter Erin in a 2003 car crash, envisions a place where she can feel her daughter’s lively spirit. “I can’t wait because it will be peaceful,” she said. The parents believe they found the Angel of Hope through their children’s spirits. Two members of the group, researching unrelated topics, came across the angel and simultaneously brought it up at their meeting. The Angel of Hope began with author Richard Paul Evans’ book, “The Christmas Box,” a story that expresses the undying love parents have for their children. The story includes an angel sculpture where parents lay flowers in memory of their children. Two years after publishing the book and having met many parents at book signings who had lost their children, the author wanted to make the angel a reality. A meeting with Utah sculptor Ortho Fairbanks, who lost a child himself, resulted in Fairbanks sculpting the first bronze Angel of Hope with the face of a child and the word HOPE embedded into one wing. It was dedicated in December 2004 in Salt Lake City. “I was just so moved by her,” said Marianne Stapleton, whose daughter, Chelsea, died at the age of 17 in a 2007 motorcycle crash. The Catholic Diocese is donating the land. The Angel memorial is for every parent who has lost a child, Fernandez said. “The idea of hope is the belief that in another place you’re going to be reunited with them,” she said. The group already has raised $60,000 of $100,000 needed to erect the 4-foot 3-inch sculpture with a 5-foot 2-inch wingspan. Additional money needs to be raised for the lush tree- and shrub-filled landscaping. Already, there are several patrons who have donated $2,500 or more, including Searcy, Denny Scarola, Barnhart and Shipley, the Quigley Family Foundation, the Bobby Resciniti Healing Hearts Foundation, The Lattner Foundation, Slawson Cunningham Whalen and Gaspari P.L., and Jack Nicklaus. Families also can buy 4-inch by 8-inch bricks in memory of their children to be placed around the base of the statue. Each is $100. To donate or learn more, contact Tom Jordan, administrator of Our Lady Queen of Peace Cemetery at (561) 793-0711.